You have dreams and aspirations. Maybe they’re active. Or, maybe they’re buried. And in this week’s Wednesdays With Wayne, we’re looking at the Quest you’re on. Daring to honor your dreams is an entirely separate topic. Let’s just put it out there: You owe it to yourself and the people you serve to step further into your dreams because the chances are likely that you become a better human for doing so. And that means, you enhance those around you. Bottom line on the Pursuing Your Dreams thing – Do It!!! How do you know that the quest you’re on is the right one? The answer is simple – your passion ignites. Your quest becomes a calling. I’ll go personal here for a second to see if this resonates with you. For a long time, I don’t think I had anything I called a hobby. I practiced and taught martial arts. I performed magic in a local night club on a weekly basis. I wrote books. I juggled family life. And I worked a full-time job. None of those endeavors were hobbies. I was driven to engage in each of them, so I had a series of passion projects. Now, I study guitar. That’s a hobby. I don’t think I’ll ever get really good at it. I’m not driven to practice, but I like getting better. I could set it down at any point and be fine. My quest, or calling, is to lift people’s leadership and to teach, touch, and transform their lives. As a Global Executive Coach working with senior leaders, I effect change on multiple levels. The individual leader gets better, his/her organization becomes more productive and efficient as the culture comes together, and his/her family life improves. That’s the work I do and really, I must do it. I don’t know how not to do it. Apparently, you are considered one of the “lucky ones” if you know what your quest is. Some don’t feel “called” to do anything, so they just carry on day to day. I believe we each want to make a difference in others’ lives. It may not be on a grand scale; it could be that we do this for one person at a time. 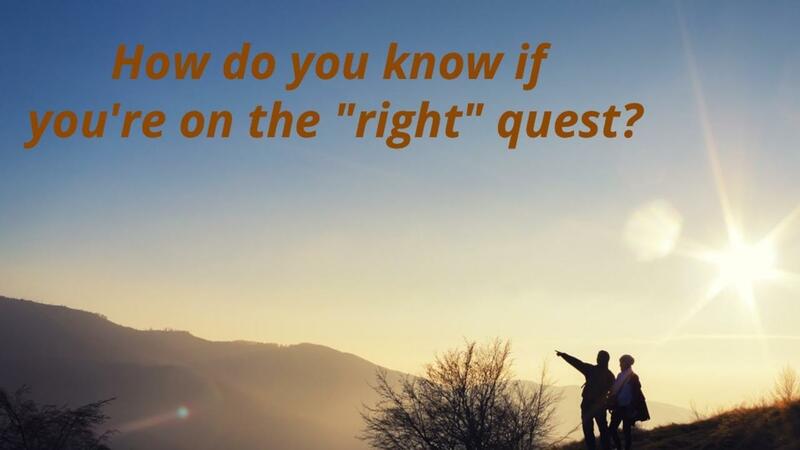 The big question, at the end of all of this is how to know if you are on the “right” quest. The answer can be found in something that we overlook all too often: Intuition. That gut feeling of being in the right place (or the wrong place) needs to be acknowledged. If you look back at almost anything that didn’t work out the way you wanted, you can likely identify a feeling of “off.” Somewhere along the way, you knew something was off and you kept on the path to its unfortunate outcome. And, by the same token, you can reflect on the successes in your life. You’ll be able to say, “Yep, those choices just felt right.” Even the most cerebral of our friends get gut feelings. Whether you’re making a choice about a meal, a career path, or a partner, you know if it’s right or not. Keep in mind that the choices you make now with long-term variables (e.g. career or partner) could work out differently in the future. In my career path over the past decades, I’ve held two jobs that I knew were a mismatch for me. In one of them, I awoke every morning and the first words out of my mouth were, “oh s**t.” That should have been a clue. It was, but I ignored it. And then, in traffic, that was stop-go, stop-go, stop-stop, I made that last one a stop-go and rear-ended a trash truck. That was a pretty big clue that I couldn’t ignore. I was out of alignment and not listening to what I knew to be true. Do you plan for your tomorrow before going to bed each night? What is your first action (after attending to biological needs) upon awakening? Hint: It isn’t grabbing your phone to check email! In my Amazon #1 Best-Selling books, The Significance Factor and Dynamic Transitions, I give you the path for redefining success for where you are NOW. What got you to the place you are, won’t get you to your next. And it’s that that gets you out of alignment. You’ve changed over the years. Your wants and needs have changed. And, your values have changed. Reflecting on all of this and renewing your passion will assure that you’re on the “right” quest! Get out there and keep making your magic! The world still needs what you have to offer! Okay, so you missed registration for this month’s breakthrough retreat. If you’re interested in joining me, keep October 18th and 19th on your calendar and CLICK HERE to add your name to the wait list!